In correlation with my Writing Prompt Blitz-o-Rama Contest, here is the Day 1 prompt for September 1st. Day 1-Dragon Prompt-Write a story in which a dragon is not a fearsome creature. Not all dragons have to be horrifying. Although this one would creep me out if I saw it in my room. Below is my entry. If you’re interested in competing with me or just joining in, you can win a $25 gift card to Amazon.com and free promotion of whatever you like. Just link your entry from your own website or blog or share it any other way you’d like. You can also email me at philoverby1@gmail.com your entry and I’ll post it directly here to my blog. My thoughts on the prompt: Dragons are typically viewed as horrible, destructive creatures. Either that or beautiful, majestic beings that inspire awe. That is why I think having a prompt that challenges you to use dragons in a way in which they are not terrifying is an interesting concept. Here is my attempt. Hope you enjoy! Not all circuses have lions, tigers, and bears. You thought I was going to say “Oh my!” didn’t you? “Daddy, I want to ride the dragon!” My daughter Jala screeched in my ear. Even at three years old, her voice carried over even the loudest banshee in all of Tinderloth. I pulled her closer, her snow leopard fur coat scratching against my face. Wriggling in my grasp, I set her down to avoid getting my eyes clawed out. Chained to four posts, the dragon sat back on its haunches, wings weighed down with heavy iron balls. Bells hung from its horns; they jingled as it snorted and shifted its head. A man sat a young boy on a multi-colored blanket draped over the dragon’s back. It didn’t resist at all, just lowered its head and blew dust across the barren field. The Circus of Black Burlai was always known to be a rather sombre affair for me. It was on the fields of the ruined city where I spilled the blood of so many dragons before. The Slaughter of ’66 still lingered in my mind. My sword hand twitched even as it hovered over the pommel of my long knife tucked into my sash. I snapped out of my reverie. It wasn’t time to kill. Jala’s stomping of her feet meant it was time to entertain or else have to dunk my head in ice water later to kill my headache. “OK, let’s go take a look,” I said, grabbing her by the hand. The Circus of Black Burlai swirled around me. So many black cloaked figures smelling of spice and garlic shuffled past me, some of their fingers in a constant state of the Wriggle, an involuntary twitching of fingers that kept magic flowing properly through their veins. It reminded me of my own twitching. If I didn’t have my long knife, I got some phantom tingling where it was supposed to be. The roasting of long strips of beef and whole eggplants filled my nostrils. My stomach rumbled. Jala wanting to see the clown pit fighting caused me to miss breakfast. I stopped at a nearby stall, but Jala wasn’t having it. She continued to pull me along. “Hurry, they may be shutting down the ride soon,” she said as she pulled me along. That’s when I saw him. Why here? Why then? Amongst all the black, he stuck out like a big fat blueberry. His white beard jutted out from beneath his shimmering blue helm. His dragon scale armor had all the children gathered around him admiring its luster. The twitching began. 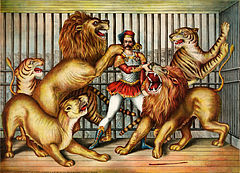 Zorundo, Scourge of the Scaled, didn’t show up at the circus to have fun. He was there to finish a job. A job he didn’t get done in the Slaughter of ’66. As we passed him, he stared at me even as the children begged for his autograph and tugged at his chain mail skirt. His voice boomed over all the revelry just as it did on the battlefield. “An old–friend” I hesitated to say “friend” but finished the statement before Zorundo reached me. “I did,” I said, keeping my eyes on Jala. Her pouting face shifted between me and Zorundo. “Jala,” I answered for her. I looked down at his hand, still clutching my arm. A flash of steel came to the blue armored warrior’s hand. When I looked down, three of my fingers were missing. They lie in the dirt, curling up. Too bad for Zorundo that wasn’t my sword hand. My long knife whipped out of my sash and buried itself up to the hilt under Zorundo’s chin. The dragon slayer gasped and gurgled. His eyes rolled into the back of his head and he hit the ground, his helm clattering off. A child ran by and scooped it up, laughing as he tossed it up into the air. Wincing, I wrapped my sash around my hand to stop the bleeding. I felt faint, but I blinked to keep myself standing. No one else moved to help me. The Circus of Black Burlai didn’t care for blood spilled. As long as it wasn’t there own kind. Eventually, black cloaked figures came and took parts of Zorundo’s armor and boots. But I didn’t focus on that. The only thing I saw was my smiling daughter, clapping her hands as she sat on the back of a weary old dragon. A dragon that maybe should have died in ’66. But was there, creating a moment that could never be erased from my memory. Jala ran back after it was finished, her eyes dull and bored. “What is it, honey?” I said. Remember, leave your story link in the comments below. Or send it to me at philoverby1@gmail.com. Thanks! Hope you enjoyed!